For more information on how your child can take part in the life–changing ministry of RAS, please contact: holley.bryant@rogersschool.org or 509.529.1850. Rogers Adventist School has enjoyed a long history of good music ensembles, and we are delighted to host them today. Please join me in thanking the many students, their teachers, and parents. We hear the Jr. High Hand Bell Choir, the Treble Choir (grades 3–4), and the Honors Choir (grades 5–8), all directed by Patti Short and accompanied by Melissa Cadieux. We also hear a double string quartet directed by Holly Blackwelder-Carpenter. Although we were not able to include them in today’s service, we have two special guests from Andrews University on campus this weekend, Carla Trynchuk, violin, and Chi Yong Yun, piano. You are invited to their recital tomorrow at 7pm in the Fine Arts Center. The offertory presents the favorite hymn How Great Thou Art (No.86). As you prepare your heart to worship God, I invite you to meditate silently on the words of this hymn, some of which are given here. Thank you for your generosity to the local ministry of the University Church, as well as to the global mission of the Adventist Church. Today, the loose offering goes to the University Church budget. Donations to the University Church budget fund all local ministries, including youth and children, WWVA and Rogers subsidies, broadcast, worship, and the upkeep of the church campus. Thank you for your support and dedication to this community! This Sabbath the University Church welcomes to the pulpit our new senior pastor Andreas Beccai. This will be his fourth sermon in 2019, but only his first officially as senior pastor. We are grateful to the Upper Columbia Conference leadership for being present to pray a blessing over Andreas' ministry in Walla Walla. Andreas grew up in the United Kingdom and previously pastored in the Seattle area. He is joined in Walla Walla by his wife, Cassandre, and daughter, Eden. Church Board Meeting will be Monday, March 18, 7pm in the Youth Room. All are welcome to attend. You are invited to a fund-raising concert presented by the Walla Walla University Symphony Orchestra, directed by Brandon Beck, in preparation for the exciting opportunity to perform at Carnegie Hall on June 21, 2019. The concert will include Overture, “Die Zauberflote” by Wolfgang Amadeus Mozart, Suite in A major, Op 98b (American) by Antonin Dvorak, Symphony No. 1 in G minor by Vasily Kalinnikov. Tax–deductible donations accepted online payment.wallawalla.edu/donate/MUSICORCH or at the concert in the University Church Sanctuary. The 50+ potluck and program will be held on Sunday, March 17 at the Village Church Youth Center, 8th and Bade in College Place. Come and enjoy an uplifting musical vocal program presented by Gina Lincoln, accompanied by Jan Roberts. And of course, please bring a friend! Are you an Andrews University alum? Or are you a student considering attending Andrews University? Come for a complimentary dinner hosted by Andrews at its Walla Walla regional event on Monday, March 24 at 6pm at Courtyard Marriott Walla Walla, 550 West Rose Street. Network with Andrews alums, enjoy a delicious meal, and hear the latest news from Andrews University. Reserve your spot (it’s free!) at alumni.andrews.edu/rsvp or at 269.471.3591, alumni@andrews.edu. We hope to see you there! All are welcome to join our University Church prayer meeting each Wednesday at 7pm in Heubach Chapel. The group will view a part of the current week’s Sabbath School lesson in Ranko Stefanovic’s, “Revelation of Jesus Christ”video. Jim Libby from Anchorage, AK, the brother of University Church member Lauri Rootvik, was killed in a motorcycle accident in Baja, California on March 10. He was part of a large and growing family and often led dentistry teams in various world fields. He is survived by his wife, Pam, and sons Justin and Landon, both graduates of Walla Walla University. Kenneth Ladd, the husband of Jackie Ladd and father of Lisa Comeau and Michael Ladd, died in Burlington, VT on March 10. He worked in financial administration for the SDA church for over 40 years. A memorial service will be scheduled in College Place later this spring. Pearl “Pat” Crabtree, mother of David Crabtree, died on Friday, March 1. A private memorial service is planned for early April. We invite you to remember the Crabtree family in your prayers. Sam LeFore, husband of Donna LeFore and father of University Church member Tamara Reeves passed away on February 5. He was loved by the Church family and all who knew him. Please join us for a Celebration of Life service on March 16, 3pm in the Milton Adventist Church. Refreshments and fellowship will follow the service in the Milton Church Fellowship Hall. Retired pastor Elwood Boyd passed away Sunday morning February 17. A Celebration of Life service to remember him will be held Sabbath, March 16 at 3:30pm in the Eastgate Seventh-day Adventist Church. In lieu of flowers the family would ask for your financial support of the Julianna Sayler Foundation which supports research and families experiencing DIPG Pediatric Brain Cancer. Visit www.teamjulianna.org for more information. Rogers Adventist School Early Registration is open! Both new and current students are eligible to pay enrollment fees for the 2019-20 school year. Early: $175 (March 1-31); Regular: $225 (April 1-June 9); Summer: $250 (June 10 and after). Current students are guaranteed a seat in classrooms until March 31. Starting April 1, open seats are available to new students. Contact Holley Bryant at holley.bryant@rogersschool.org with questions. Taj Pacleb will be at the College Place Village Church March 15 - 23 for an inspirational series of Bible presentations, nighty at 6:45pm. There will be an exciting VBS program for the children ages 3 - 12 going on simultaneously. Bring a friend and gain a blessing. La Sierra University is in search of a new president; a leader who is passionate about the distinctive culture of a liberal arts university on a campus rich with ethnic, cultural and religious diversity. The La Sierra University Presidential Search Committee requests recommendations or applications for this position to be sent to:presidentialsearch@lasierra.edu. To ensure full consideration, applications should be received by March 31, 2019. Click here for additional information and requirements. Register now for the 2019 AMEN NW Conference. The Master Plan: Forgiveness & Healing May 9-11, 2019 at the Upper Columbia Conference in Spokane. Keynote speaker Dr. Mark Sandoval will present a series entitled “The Law of Life.” Endocrinologist Dr. Hana Kahleova will share up-to-date research on diabetes and the effects of a plant-based diet. This conference is for all health care providers, pastors, Bible workers, and health ministries leaders. Visit www.uccsda.org/AMEN2019 for more information and to register. Reserve your lodging for Upper Columbia Conference camp meeting. The main speakers this year are Randy Roberts, senior pastor of the Loma Linda University Adventist Church and Sung Kwon, director of the North American Division Adventist Community Services. The early morning session will focus on the family with Claudio Consuegra. Your whole family will be spiritually blessed as we seek to build up the family of God. Seminars on how to reach missing members, how to reverse diabetes, biblical truths and training our children are just some of the topics. Invite your new members and interests! Go to: https://www.uccsda.org/campmeeting to register. Summer camp is coming and we are excited for an amazing summer. Oshkosh also happens towards the end of summer 2019. We would like every Pathfinder to be able to attend both Oshkosh and Camp MiVoden summer camp. So if you are going to Oshkosh and want to be at camp we will give you $100 discount in addition to other discounts for being at Oshkosh, (amount will not be great than the cost of camp). You must bring /send a copy of your Oshkosh ticket for the discount. Questions please call 509-242-0506 or email – denisek@uccsda.org. Are you looking to make a difference for God? Are you interested in leading others to a deeper relationship with Jesus Christ? We are seeking committed men and women to serve as Outreach Coordinators in all of our church districts. What is an Outreach Coordinator? The position is a blend of community Bible work and member equiper and trainer. In partnership with the pastor, they are the outreach leader for the church with the responsibility of fostering an evangelistic culture. Dr. Ranko Stefanovic, renowned theologian, author, and educator of New Testament studies will be giving a weekend seminar on the book of Revelation. April 19, 20 there will be a Friday evening presentation at 7 p.m, Sabbath church service, and a Saturday afternoon presentation at 2 p.m. following potluck. All meetings are held at the Moscow, Idaho, SDA church (1015 W C St, Moscow, ID 83843) All are welcome to attend. Interested in creating a Will, as well as power of attorney and other estate planning documents? Free estate planning is offered as a service of the Upper Columbia Conference Trust Dept. for UCC members. We help you take care of family, and just ask that you have a desire to make a significant difference in some way connected with Upper Columbia Conference (evangelism, your local church or school, etc.). For more information, or to arrange an appointment next time a representative is in your area, please contact Andrew McCrary at 509.242.0472 or E-mail AndrewM@uccsda.org. 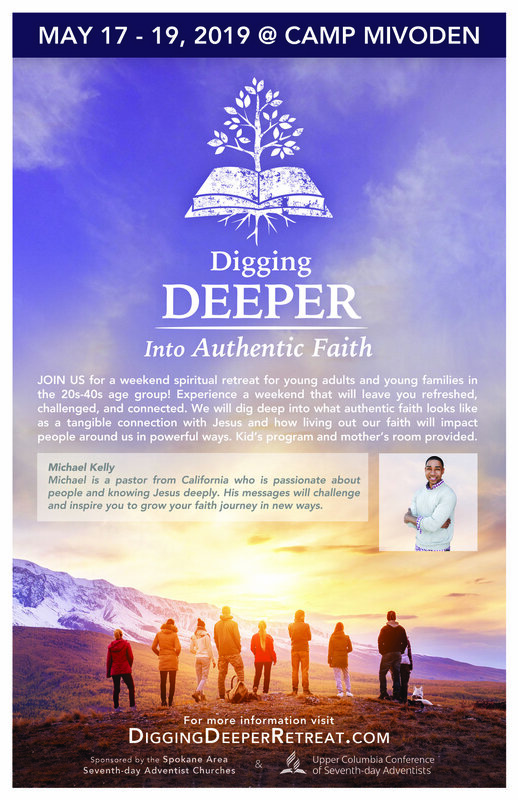 Attend the Digging Deeper Retreat, a spiritual retreat for young adults & young families in their 20s–40s, May 17–19 at Camp MiVoden. There will be times of worship & music, powerful messages, good food, hiking & canoeing. Our keynote speaker, Michael Kelly, will lead us in digging deeper into the theme, Authentic Faith. Children’s program for ages 4–10 years, childcare for ages 18 months to 3 years, and a mother’s room for infants will be provided at the retreat. Scholarships available. For more information visit: www.DiggingDeeperRetreat.com. Attention ATV enthusiasts and horsemen – The Adventist Horseman’s Association is inviting you to participate in their annual Cowboy Camp Meeting. If you enjoy camping in the national forest and riding the trails you will love this event. Find out more by attending an informational meeting at the Milton-Freewater Church Fellowship Hall, March 16 at 6:30pm. For more info call 360.607.7446. THANK YOU to those of you who have registered to volunteer for the Love Heals Walla Walla free clinic event on April 18 and 19! Additional volunteers are still needed in several areas including: dental (dentists, hygienists, assistants and sterilization/central supply), massage/PT/OT/chiropractors, and hospitality (greeters/patient escorts). Limited licensure is available for out-of-state and retired practitioners. Text “loveheals” to 55222 for a link to register or visit lovehealswallawalla.org. Volunteer registration will be open through Sunday, March 10.